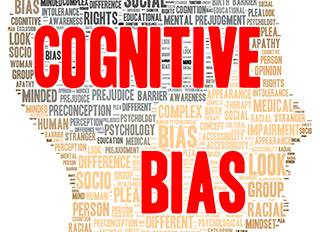 Facts of Life Insurance – Why Do We Have a Cognitive Bias? There can be biases for lots of reasons. We’ll explore 3 examples they we have seen that are probably all too common. Even independent agents can have a bias to a specific carrier or a handful of companies. It happens to us. We have a stretch of time where certain companies continually price well, are easy to work with, or really competitive with their underwriting. We may lock into them without even knowing it until they stop being as competitive. We have favorites for survivor policies. We have favorites for term. We have favorites for equity indexed universal life. Those may change in 6 months. One example that sticks out is an agent we met that used to be a captive agent. He still touts that one company even though we can show him a proposal with better pricing and a better product of insurance. He remains resistant to moving beyond his comfort level. Consumers form their own cognitve biases by what they see on TV, or who they worth with, or what another family memeber has or even who they go to church with every week. They get stuck what they think they need. One example we came across recently was client that asked about burial insurance. That really isn’t the type of coverage that we handle but, there are agents that focus on that market. This lady specifically told us that she didn’t want anything crazy like $100,000. We are thinking anything less than that is crazy. $15,000 is the amount she had in her mind. She also didn’t want to do an exam or answer more than 3 questions. The insurance company was being too invasive. If we give the insurance company a little information to use their minds it could greatly reduce the price. Her ristance was engrained in her bias from those around her and it was something she couldn’t get past. Along the sames lines are agents that promote nonmedical insurance companies and consumers that are resistant to doing an exam. We had a case recently we are insuring the owners of company. Each owners stake is approximately 1 million. It is a fairly typical buy-sell arrangement for a dozen owners. One of the board members figured they didn’t want quotes from carriers that required an exam. The owners would be reluctant to do an exam. However, all of the stakeholders realized it would be less expensive to do the exam. Nobody was resistant to do an exam That board had developed his own bias that stemmed from somewhere. Clients that are reluctant to do an exam maybe happy paying 25% more for their coverage. In the end they may not be a good client for you.